We’ve been talking about a rebirth of British sportscar legends TVR for, what, four years now? Two years ago we learned it would have a design by McLaren F1 (and nifty city car) designer Gordon Murray, and last year we learned it would be made of carbon fiber using Murray’s iStream novel carbon fiber construction system. Now, finally, it looks like we have a date for the reveal: on September 8th, at the Goodwood Revival. So it’s a sub-four second 0-60 5-liter V8, and if you were wondering about the pitch-level of the anticipation and demand, TVR claims it’s at the FEVER reading on the pitchometer. The 400 brake-horsepower per “tonne” is interesting, which I suspect means that the car will weight at least one ton and have at least 400 bhp, but expect more of both. Actually, the car is said to weigh 1200kg (2645 lbs), so if a metric ton is 1000 kg, and the car makes 400 bhp/1000 kg, then I think we can say that the new TVR should have, what, 480 bhp? Also, keep in mind that bhp numbers are usually less than hp, since bhp doesn’t factor in losses from parasitic ancillary engine parts. 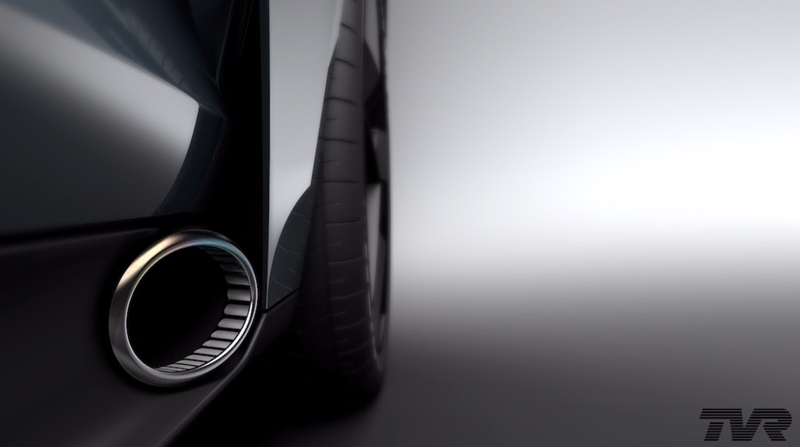 One teaser picture has been released, the one up top there, and all that does is confirm that this new, reborn TVR will have wheels with tires, bodywork, and it looks like side-exiting exhausts. Not a bad start! I’ll be interested to see what this new TVR turns out to be. I mean, Top Gear referred to the upcoming front-engine/rear drive car as “God’s own sports car” so it’s not like it has a lot to live up to or anything.